-put 3 settlers on food, 2 on a hunt, and use one settler to shoot the animals towards your town center. -when the 3 settlers have collected all the food, send 2 of them to a hunt, 1 gathers the wood, builds 1 house and than goes to a hunt too. -your first card is [3 settlers], age when you have 15 settlers. Gold, Wood, XP, Food, settler treasures. -If you get the [240 wood] treasure, I recommend getting an trade post for faster shipments. -put 3 settlers on food, 2 on a hunt and let one settler herd animals towards your town center. -If you get the [240 wood] treasure, I recommend sending ATP and get 2 trade posts. -send 9 settlers to wood, 4 on food, and 2 towards the forward base, let them cut wood when they arrive. -place 10 settlers on wood, 5 on food; you don't need to send a settler to forward base, so you can do with a bit delay if you don't have the 200 wood ready by aging. 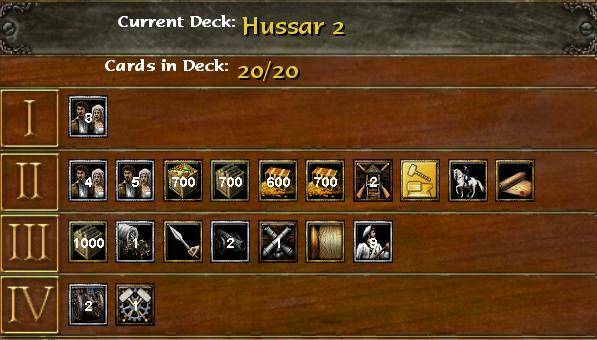 -make a stable, send [700 wood] as your second card, make 2 or 3 settlers, and make queue ASAP at least 1 hussar, you can add more when you have the recourses. -send the tower to the forward base and gather the gold. -send 6 settlers on gold, 8 on food and 1 on wood. -when the [700 wood] arrives, use your settler on wood to gather it and make houses ASAP. -your third card is [700 gold], when you're going to collect it, send -5 settlers from your gold mine to food to compensate the flow of gold and use 2 other gold settler to gather the gold. -when you have 5, go scout with them and raid if possible, until you attack. 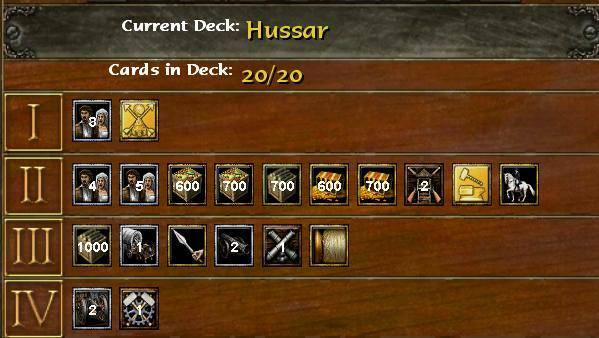 -now you can chose yourself which cards to use, usually I use the other gold resource card, and than the settler cards. Devjavu An example deck 2. -watch your horses and micro! Always run for pikes, rodeleros and muskets, NEVER engage them, you'll get destroyed and gone are your expensive soldiers. I usually split them in two groups to attack from both sides, which makes it harder for them to defend themselves against the hussars. -If the rush fails, or at least you can't get through their defense, pull back and focus on raiding their settlers, or at least forcing them to garrison their settler or loose them, this way you'll effectively disrupt their economy since running settlers are idle settlers.